Avoid the crowds and soak up the the serenity at beautiful Lonely Beach. Lonely Beach prides itself on being “miles from the party,” and if you’re looking to avoid the backpacker bar scene and enjoy some tropical tranquility, Lonely Beach is a great option on the northernmost tip of the island. 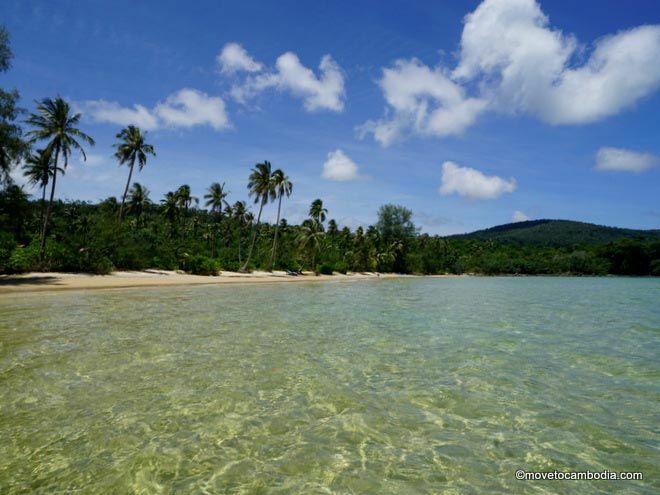 Because of its isolated location, Lonely Beach is almost entirely empty, so you can keep the stunning all to yourself. Lonely Beach’s bungalows are nestled in a jungle landscape next to a truly gorgeous beach. Because there’s nothing else there, if you are staying at Lonely Beach you’ll be one of the only people enjoying it. The place is very secluded, so at night it’s possible to see Koh Rong’s famous bioluminescent plankton — splash around in the water after dark and the movement makes them glow. They have one-bed bungalows for two with a private bathroom, and two family bungalow with two double beds. 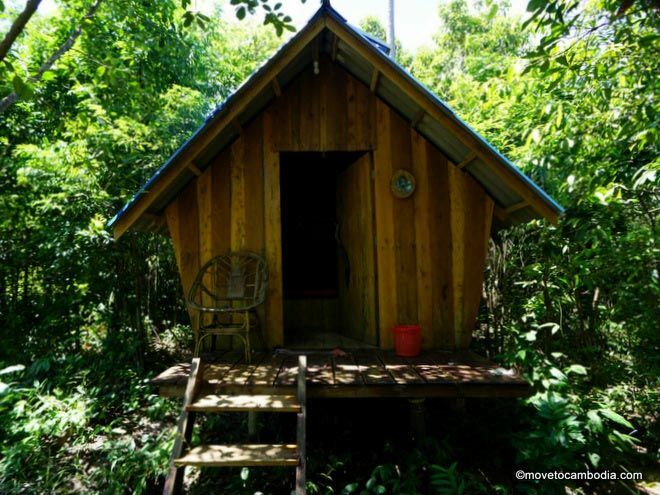 There are also “bird’s nest” bungalows which are quite small and contain nothing other than a double bed, but are less expensive. 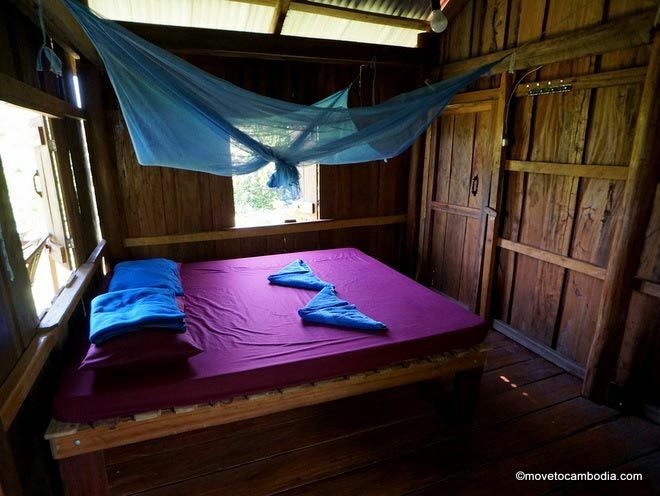 Bungalows have solar-powered lights and bucket showers, and each bed has its own mosquito net. An inexpensive “bird’s nest” bungalow at Lonely Beach. 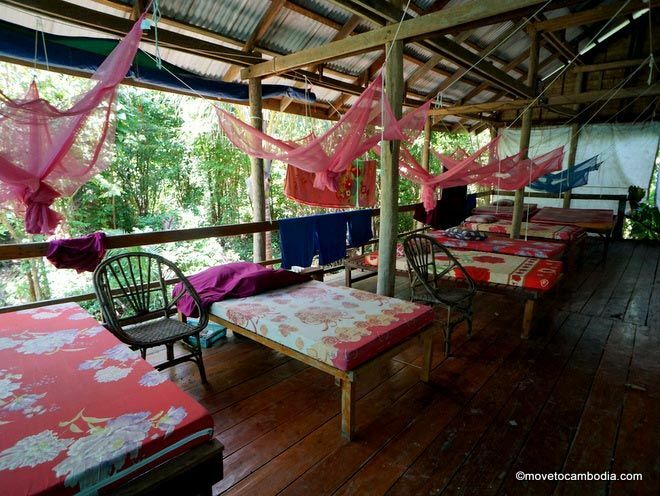 All bungalows have a private balcony with either hammocks or chairs for lounging and enjoying the jungle and sea views. There’s also an eight-bed mixed dorm that’s best enjoyed in high season. It’s got open sides for air circulation, so when it rains, guests can get a little bit wet. The breezy Lonely Beach dorm. Lonely Beach gets rave reviews from visitors who savor the chilled-out atmosphere. Because there is nothing else on this part of the island — no ATMS, no stores — bring enough cash to see you through, as well as any other supplies you might need. It’s possible to walk to Prek Svay Village from Lonely Beach, but there’s not a lot there either. Lonely Beach is undeniably rustic, possibly to a fault. There’s no WiFi (if you need internet, bring a Smart SIM card with you), no hot water, no fans in the bungalows, muddy paths — but that’s what makes the place so special. Lonely Beach is the perfect place to unwind and disconnect. The restaurant is solar powered, and serves a variety of local and Western dishes at reasonable prices. No fan, no electricity outlets…Lonely Beach is rustic, but that’s its charm. To get to Lonely Beach you’ll need to take their private slow boat from the Sihanoukville Pier. Tickets cost $20 round-trip, and need to be organized at the time you make your booking at Lonely Beach. Bookings can be made directly through the Lonely Beach site, although when we emailed them we did not get a response, so it might be worth calling.